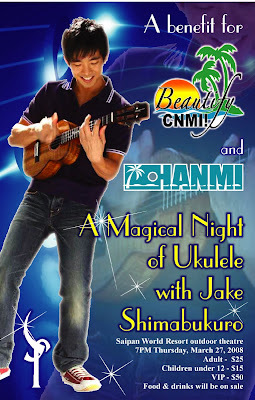 Yesterday's Beautify CNMI anniversary concert with Jake Shimabukuro was an all day affair. The concert took up the entire evening, but even before that we were setting up and going on the radio to promote the show. We even took some time to plant a tree with Jake. THE winners of this year’s Beautify CNMI! Steward and Champion awards will be announced at the Saipan World Resort on March 27. Beautify CNMI! volunteer Angelo Villagomez said the two recipients of the awards will be recognized for their contribution as exceptional environmental leaders during the last 12 months. “Beautify CNMI! is celebrating its second anniversary and we will be giving out two award categories: the Environmental Steward and the Environmental Champion,” Villagomez said. The Steward Award is given to an individual or an organization who has demonstrated real concern for the islands of the CNMI. The Champion Award is given to a person or group who shows the true spirit of Beautify CNMI! Among the criteria used for picking the winners are volunteerism, innovation, cooperation, creativity and the ability to spread the “beauty virus” all over the island. As part of their anniversary celebration, Villagomez is also inviting the public to get their tickets now for the world renowned ukulele virtuoso Jake Shimabukuro’s concert which will be held on the same night. “VIP tickets for the concert are already sold out and we are urging everyone to buy their tickets now before everything is sold out,” Villagomez said. He said the doors will open at 6:30 p.m. as the concert will start at 7 p.m.
“We are inviting one and all to come to the concert. This is a real treat for the people of CNMI,” he added. The proceeds of the concert will benefit the Beautify CNMI! and the Hotel Association of the Northern Marianas Islands. Villagomez said the local audience will surely be entertained by the Shimabukuro’s revolutionary musical playing which ranges from jazz, blues, funk, and classical, bluegrass, folk, flamenco and rock. Villagomez said the tickets are $25 for adults and $15 for children less than 12 years in age. Tickets are available at the Century Hotel, the Marianas Eye Institute or you may call Beautify CNMI! volunteer line at 285-6462. BEAUTIFY CNMI!’s parks and trails committee is planning to join National Trails Day, an annual event hosted by the American Hiking Society on June 7. Kenneth E. Kramer, Marianas Resource Conservation and Development Council coordinator and chairman of the committee, yesterday said joining the event is one way to put Saipan on the global map. “Just for joining, we can get free advertising on their Web site, and people all over the world will know where Saipan is when they visit the American Hiking Society Web site,” Kramer said. He said in addition to the free advertising on the Web site, they can also avail of banners and posters. “It would be very nice to have each island come up with its own trail and people can go out to hike on different trails during that day,” Kramer said. He added that this will be the first time for the CNMI to join National Trails Day. He said in the past, they have worked closely with the Boys Scout in their hiking activities. Information from the Beautify CNMI! Web site disclosed that this year, its parks and trails committee will continue to push for the creation of a commonwealth parks system. The goal is to create a system of hiking trails that links the different parks and conservation areas on Saipan and will stretch from Suicide Cliff to Susupe Lake. Kramer said the first day of June is designated as National Trails Day in the United States. This is an event which draws millions of hikers and bikers go out to the different trails in the United States. It is organized nationwide by the American Hiking Society, a national nonprofit trail advocacy group based in Washington, D.C. Currently, it has more than 3,000 events organized in each locality. Kramer is also inviting community members to join Beautify CNMI!’s ongoing campaigns. The group, he said, is involved in all kinds of activities to keep the islands clean and attractive — picking up trash from the roadsides and beaches and planting trees. The concert, held in conjunction with Beautify CNMI's two-year anniversary, will be held on March 27, 2008, at the Saipan World Resort. Known for his lightning-fast fingers and revolutionary playing, Shimabukuro's musical styling ranges from jazz, blues, funk, and classical, to bluegrass, folk, flamenco and rock. “Jake's last concert on Saipan was a sold out event and we are thrilled to bring him back on island for a second time,” said HANMI chairwoman Lynn A. Knight. Proceeds from the charity concert will be divided between HANMI and Beautify CNMI, both non-profit organizations. Tickets are $25 for adults and $15 for children less than 12 years in age. A limited number of VIP tickets are available for $50. Tickets are available for purchase at Century Hotel and Marianas Eye Institute. For additional ticket information or to purchase VIP tickets, call the PTI-sponsored Beautify CNMI volunteer line at 285-6462. HANMI was established in August 29, 1985, after a group of hotel operators came together and saw the need to form an organization representing the hospitality industry in the CNMI. Beautify CNMI is a coalition of various government agencies, businesses, non-profit organizations, private citizens and visitors. Its mission is to foster community pride through a beautification campaign aimed at enhancing the beauty of the island environments and quality of life through public education on recycling, restoration, waste management, and enforcement of laws. THANKS, MAX AGUON AND CREW! FIVE individuals volunteered to “transform” the stretch of the beach area from Sugar Dock all the way to Aquarius Beach as part of their ongoing cleanup efforts. Led by Max Aguon, who used to work in a private company, about five to six local residents also put up barriers to prevent people from driving on the beach. Coastal Resource Management Office Director John Joyner said the area is now totally different from how it looked like two months ago, and the residents who cleaned it up should be commended. This shows that the spirit of Beautify CNMI! is still alive among members of the community, he added. The small structure at the end of Sugar Dock which was badly littered before is now clean. Joyner said volunteers continue to pick any litter they find in the area. CRMO wants to highlight the activities of volunteers because the agency is also in the business of “catching people for doing right and not only for doing wrong,” he added. CRMO at the same time will work with the Department of Public Lands, the Marianas Visitors Authority and the Department of Public Works in getting rid of the concrete structure at the end of Sugar Dock, Joyner said. This structure is being used by children as a “playground” and sometimes a “diving board” even tough it poses danger to them, he added. “We don’t want to see children diving from that structure. People should dive under safe conditions,” he said. 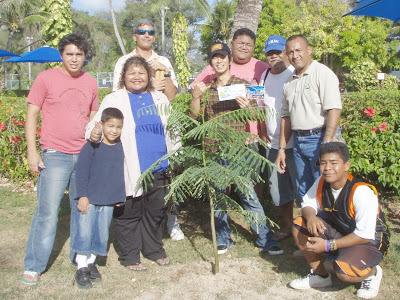 Marianas Visitors Authority donated $10,000 to Beautify CNMI in 2007. The financial report on how the money was spent can be downloaded here. There are two award categories: the Environmental Steward and the Environmental Champion. The Steward award recognizes a person or group that leads the community in activities that help protect the environment in a variety of ways. This individual or group has demonstrated the need to take pride in the islands and to take care of the place we all call home. They serve as an example for others, especially the next generation, to follow. The Champion award recognizes a person or group that exemplifies the Beautify CNMI spirit. Those qualities include volunteerism, cooperation, innovation, creativity and the ability to infect others with the Beauty Virus. The Environmental Champion is a role model for others to follow. They bring environmental issues to the forefront of public consciousness. They make things happen and effect change. Send nominations to Angelo Villagomez at angelovillagomez@gmail.com or mail them to PO BOX 505149; Saipan, MP 96950 or call the PTI sponsored Beautify CNMI volunteer line at 285-6462 for more information. The deadline for nominations is this Friday, March 7 2008.